I will blog my cooking notes here on a recent batch of Nasi lemak Sambal which turned out very well. It should be on the sweet side, complimenting the savoury nasi (coconut rice), ikan bilis (fried anchovies) and other ingredients on the plate. It's spiciness should be average so that the diner can eat more of the sambal along with the rice. I like texture in the sambal and I get this by adding slices of large red onions and fried ikan bilis towards the end. The sambal needs to have enough oil for the mouthfeel and for some of it to soak into and color the rice. 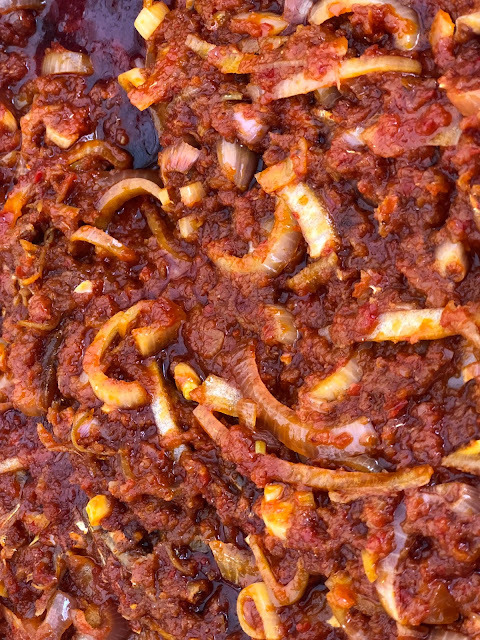 To ensure that the sambal is not just all chilli spicy, I add a lot of shallots and onions and I use fresh chilli paste to balance the spicier dried chilli paste. It is important to sweat or caramelised the shallot paste in the oil before you add in the rest. Here was my recipe and method. 500 gm of large onion slices. Blend the peeled shallots and chillies. Fry the ikan bilis in the oil. About 1-2 minutes. Set aside. Using the oil leftover from frying the ikan bilis, heat it up in a wok and add the shallot paste. Gently fry for about 10 minutes. Add the sugar, gula melaka, assam paste and salt along the way, adjusting the taste if you need to to find a good balance..
Simmer for another 15 minutes. Adjust the taste if needed. Do remember that when you add ikan bilis, the sambal will be saltier. Go easy on salt. You can even omit salt it the sambal is sufficiently savoury after you add ikan bilis. Add the slices of large onions and the fried ikan bills. Cook for another 5 minutes and switch off the fire. "More can be less" and this is especially true for Nasi lemak sambal. Avoid adding other ingredients or herbs. It is meant to be enjoyed as a part of a plate of Nasi Lemak with many other flavours. Just focus on making very good sambal. This sambal keeps well in the fridge. Enjoy. Lead photo: credit: Joyce Ho, sambal taken with fried nuts and ikan bilis.